Surviving the past two years has not been easy for Amelia Winn. Once she had a loving family, a successful career as an ER nurse and many friends but in an instant her life changed when a car ran into her and a patient outside of the hospital. She is finally coping with her hearing loss as a result of the accident but having turned to alcohol during most of those two years alienated all those around her. Now she lives by herself and her service dog, Stitch, and has finally given up alcohol and even has a job interview. She’s excited to have some purpose in life and hopes that little by little she can gain her ex-husband’s confidence and once again see her stepdaughter, Nora. Her plans go slightly awry when on the day of her job interview she is paddle boarding in the morning, one of her favorite things to do, but she makes a gruesome discovery of the body of a fellow nurse in the bushes. Understandably shaken-up Amelia misses her job interview and thinks that her ex-husband will chalk this up to another of her screw ups but Amelia is able to put things right and even lands a job as a file clerk for an oncologist. While she is sadden by the thought of her friends’ death, Amelia feels like maybe she is now on the right path to gaining what she’s lost but she can’t help but feel pulled into the mystery of how her friend died and then little things start making her question her sanity. It’s almost as if someone doesn’t want her in the way. This was a thriller that definitely kept me turning the pages. I did figure out who the killer was early on but that didn’t diminish my enjoyment of this book. In particular I liked Amelia’s fighting spirit and hope you’ll give her story a chance too. I’ve read several rave reviews of this one and it piqued my interest. Hopefully my library has a copy. This sounds like a great thriller/mystery!! I’m definitely going to seek out a copy at my library! 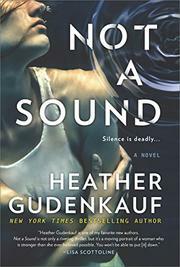 It sounds good, I like Heather Gudenkauf’s writing.